Although ear tube surgery is a relatively common procedure, surgery is not the first choice of treatment for middle ear infections. Antibiotics are usually the first course of treatment for bacterial ear infections; in many cases, acute ear infections may resolve without treatment of any kind. Many ear infections are viral and antibiotics do not help. These infections need to improve on their own, and only time can help them heal. But if your child’s ear infections recur frequently, or if your child has a hearing loss or speech delay, Dr. Klenoff, Dr. Klenoff, Dr. Lanson, Dr. Brewer or Dr. Neubauer may suggest surgery to drain fluid from the middle ear and insert a ventilation tube. Because many children have had infections in both ears, surgery is typically performed in both ears. Your child will receive general anesthesia. This means the surgery will be performed in a hospital so that an anesthesiologist can monitor your child. The procedure generally takes about 10 to 15 minutes. Drs. Klenoff, Klenoff, Lanson, Brewer or Neubauer will make a small hole in the eardrum and remove fluid from the middle ear using suction. Because Drs. 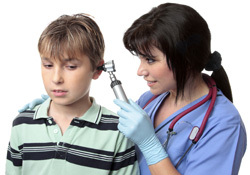 Klenoff, Klenoff, Lanson, Brewer or Neubauer can reach the eardrum through the ear canal, there is no visible incision. Inserting a small metal or plastic tube into the hole in the eardrum finishes the procedure. Substance such as water may sometimes enter the middle ear through the tube. This is generally not a problem. Drs. Klenoff, Klenoff, Lanson, Brewer or Neubauer may or may not feel that earplugs are necessary for regular bathing or swimming. In most cases, surgery to remove a tympanostomy tube is unnecessary. The tube usually falls out on its own, pushed out as the eardrum heals. A tube generally stays in the ear anywhere from 6 to 18 months, depending on the type of tube used. If the tube remains in the eardrum beyond 2 or 3 years, it will likely need to be surgically removed in order prevent a perforation in the eardrum or accumulation of debris around the tube.